Dural adhesives are available in a quantity to fit every need; from small home repairs and odd jobs to large industrial projects. Container sizes most common and supplied are 4oz, quarts, gallons, 5 gallon pails, and 55 gallon drums. We only use the highest quality materials supplied from USA suppliers. Additional sizes may be available. No. 2672-5 Contact Cement is truly a remarkable adhesive. It is fast drying, waterproof, and has long tack retention. No. 2672-5 bonds immediately and permanently without clamps or presses. It has high heat resistance and is self-curing to produce bonds of remarkable strength; especially after aging. No. 2672-5 is easy to use covering in as little as one coat and requires no mixing. Just open the container and get to work. As school budgets continue to decline, the quality of our Super Duty Mounting Cement has not! Our most economical mounting cement is what every classroom needs to ensure children (and adults) of all ages have the best product for their works of art. This product has been supplied to classrooms across the United Stated for over 55 years. Dural Company understands the importance of education and will continue to do our job to ensure the best quality product is available to everyone everywhere; manufacturing right here in the USA. 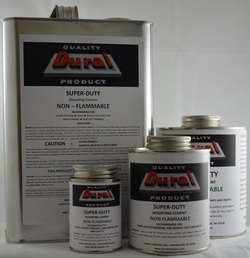 Safe for schools and institutions, Super Duty Non Flammable Mounting Cement is a high quality product. Because of its high heat resistance, Super Duty Non Flammable Mounting Cement is recommended for use by insurance agencies and fire departments. In addition, warping or separation is reduced because Super Duty Non Flammable Mounting Cement is resistant to water. Ideal for all types of paper joining. Arts and crafts watch out! Dural Company's Quick Service Rubber Cement has arrived to turn your ordinary pieces into a masterpiece! Manufactured with the finest materials, our Rubber Cement is ready to secure your finest touches to your project. Quick Service Rubber Cement if quick drying and secures in as little as one coat making projects an ease. Whether you are doing leather work or general arts and crafts, you can be sure you will have a bond that will last over time. 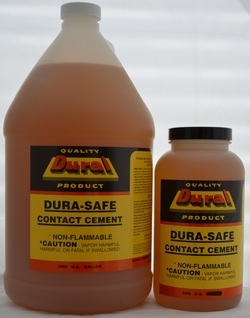 Developed in 1965, Dura-Safe has been trusted by consumers for half a century. It is non-flammable and ozone environment safe. Dura-Safe is fast drying with long tack retention. Bonds can be made in 10-15 minutes or left for over three hours. It is completely waterproof and bonds permanently. Dura-Safe has high heat resistance and is unaffected by weather conditions. It is clear (honey color) and has excellent coverage with one coat. Our Hi-Speed cleaner is the perfect solution to get that shine back into soiled leathers and fabrics. It was originally developed for golf shoes, clubs, and balls; however, our customers soon realized its all-around usability. Our Hi-Speed cleaner contains no injurious chemicals, does not explode or burn, and leaves no rings. Whether you are approaching the first tee or heading out for a night on the town, our Hi-Speed fabric and leather cleaner can ensure you attire will step up to the occasion.